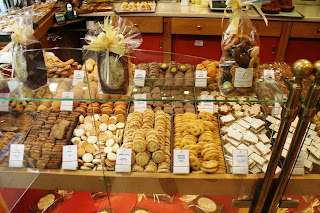 We went to France to do our Saturday shopping ... the reasons are many, suffice it to say it involves a very big and good lunch, a walk about, and almost always a walk past this particular cookie shop. Usually during the winter months, the nice ladies who staff the place are shoving samples to unwitting tourists like me who fall in love with the wares and end up walking away with EUR 50 or so worth of the stuff. I don't know if it is because I have done this so many times, or because I flirt with the nice ladies, but this time around the nice lady told the Partnerin that she remembers me as a good customer and shoveled a few free extras into the bag. Yum. I don't know if it is a good thing to be a frequent nosher at such a dangerous place, but I don't mind the perks. Still, driving 250+ km for a good cookie might be a bit over the top, no?